Bicknell's Thrush by Gerry Dewaghe. Leaves are unfurling, insects are starting to emerge, and our summer birds are flocking back to North America. But they may be carrying a toxic cargo from their tropical wintering grounds, according to an unexpected finding by researchers from the Cornell Lab, Vermont Center for Ecostudies, and Syracuse University. In the early 2000s, a group of biologists began keeping an eye on mercury levels in the Bicknell’s Thrush, which nests in mountaintop spruce-fir forests of the Northeast. This rare thrush’s high-elevation breeding grounds are particularly exposed to airborne pollutants such as mercury, a heavy metal that industrial sources pump into the air at the rate of some 2,300 metric tons per year globally. Mercury can harm wildlife when it settles and finds its way into the food web. Most of the Bicknell’s Thrush population winters in the tropical forests of Hispaniola, so the researchers, with funding from the John D. and Catherine T. MacArthur Foundation, decided to include this Caribbean island in their study. “There was no reason to think that mercury would be a problem there,” said Chris Rimmer, director of the Vermont Center for Ecostudies, who led the initial research. Mercury tends to accumulate near coal-fired power plants, gold smelters, and other industrial sources, which are rare in the Caribbean. And most of the global concern over mercury is focused on aquatic ecosystems, because water plays a key role in converting mercury into its toxic form, methylmercury. So it was a surprise when the researchers found mercury in the blood of every Bicknell’s Thrush they sampled on Hispaniola. The toxin only stays in a songbird’s blood for a month or two, so it looked like the island’s tropical forests might be mercury hotspots after all. Their interest piqued, the researchers started testing blood mercury in several other bird species on Hispaniola, including Ovenbirds, Sharp-shinned Hawks, and six resident songbirds. Their six-year study uncovered more mercury than anyone had imagined. Bicknell’s Thrushes had 2.3 times and Ovenbirds 3.6 times more mercury in their blood in Hispaniolan cloud forests than on their nesting grounds, according to the team’s 2013 study in Ecotoxicology. The songbirds with the highest mercury levels were two year-round residents of Hispaniola, the Red-legged Thrush and La Selle Thrush—the latter an endangered species found only on the island. A handful of individual songbirds had enough mercury to potentially cause breeding problems. And Sharp-shinned Hawks, which swallow a concentrated dose of mercury whenever they eat a contaminated songbird, showed the highest levels of all. The most striking find was that cloud-forest songbirds had 2 to 20 times more mercury than those in lower-lying rainforests. “There’s this soup of atmospheric pollutants in high-elevation areas,” said Jason Townsend, a former postdoctoral researcher at the Cornell Lab and lead author of the study. He and his colleagues speculated that the pervasive fog in cloud forests could provide the wet conditions that favor atmospheric mercury’s transformation into methylmercury. They also cited evidence that birds eat more invertebrates and less fruit there than in the rainforest below, which could mean that cloud-forest birds ingest higher doses of mercury. The study demonstrates the long reach of mercury pollution. Our best hope for solving Hispaniola’s mercury problem is to solve the world’s mercury problem. Earlier this year, representatives of 140 countries signed the first international treaty to reduce mercury emissions. 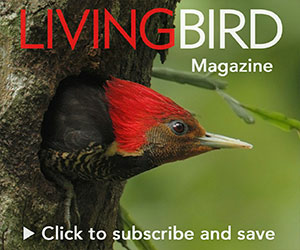 The treaty calls for monitoring programs that will be based on findings such as those from Hispaniola, according to David Evers, an avian mercury expert at Maine’s Biodiversity Research Institute. Townsend, J.M., C.C. Rimmer, C.T. Driscoll, K.P. McFarland, and E.E. Iñigo-Elias. 2013. Mercury concentrations in tropical resident and migrant songbirds on Hispaniola. Ecotoxicology 22:86–93. These efforts come none too soon. “Mercury is everywhere,” said Rimmer. “Even in places where we don’t necessarily expect it.” To protect our birds, we need to pay attention to the whole planet that we all call home.